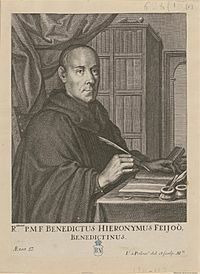 Benito Jerónimo Feijoo y Montenegro (8 October 1676 - 26 September 1764) was a Galician neoclassical monk and scholar noted for encouraging scientific thought in Galicia and Spain. He was born in Casdemiro, and joined the Benedictines at the age of 12, and had taken classes in Galicia, León, and Salamanca. He later taught theology and philosophy at the university of Oviedo, and died at Oviedo. Padre Feijoo studied in Salamanca, Spain, at the University of Oviedo, earning a professorship in theology. Feijoo was a prominent essayist for the Spanish, and his critiques, letters, and plays helped change the steadfast beliefs of many during the 18th century. His two famous multi-volume collection of essays, Teatro critico universal (1726-1739) and Cartas eruditas y curiosas cover a range of subjects, from education, law, and medicine, to superstitions and popular beliefs. He is also of interest as a writer in the Galician language. Father Feijoo was a debunker of myths. He had great interest in natural science and many of his essays touch on topics related to this subject and to the many myths about creatures and lands that abounded at that time. One example of how far his naturalistic bent went can be found in a story told by Julio A. Feijoo, one of his descendents, born in Cuba in 1910. Father Feijoo believed that demonic possession was a psychological phenomenon. Once he was called upon to perform an exorcism, and in order to demonstrate that this phenomenon was more due to suggestibility than anything else, in performing a spurious exorcism on the "possessed" subject, he read from Bocaccio's famous bawdy work the Decameron. Upon hearing the Latin lines, the "possessed" individual settled down and declared himself to be free of demonic influence. Benito Jeronimo Feijoo Facts for Kids. Kiddle Encyclopedia.